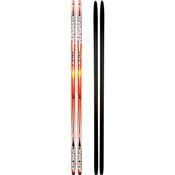 The Atomic Pro Skate Ski provides beginning to intermediate skate skiers the tools to progress. Thanks to a Semi Beta profile, the Pro Skate ski creates the ideal amount of support and torsional rigidity to develop efficient, powerful technique. The lightweight High Densolight core means every stride takes less effort, so you can focus on learning and having fun rather than struggling with your skis.